Photos of dark skinned men, sometimes even boys, in military uniform holding big guns repeatedly emerge in the media. It is a sad fact, but communities in Kenya have been radicalized. The situation in the African country barely makes the headlines, and efforts to combat such extremism never do, but local people have stepped up to fight back. 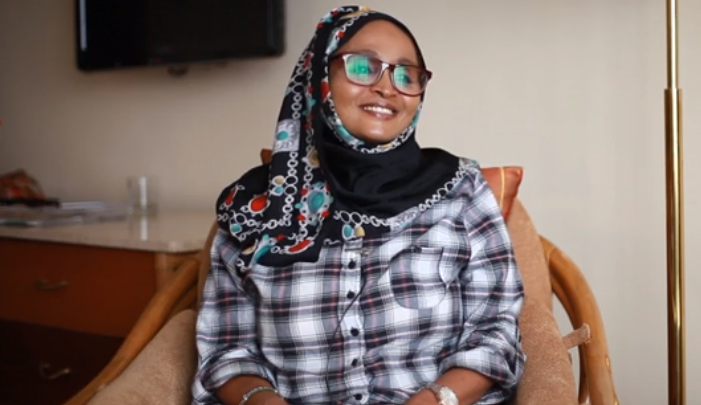 We spoke to Sureya Roble, an active member of the Maendeleo Ya Wanawake Organization and Women’s Alliance for Security Leadership (WASL), on her efforts to counter the scourge of extremism and bring peace and social cohesion to Kenya. To start off, what reason got you involved in this work? I studied as a social worker and I am trained in public administration and community development. I am lucky that I went to school because my community is still trying to understand the role of women in society. As someone who has had more opportunities, I felt compelled to give back to my society, especially in a society where women are not fully empowered to stand up and defend their rights. Women are taking charge now albeit slow, they are running businesses, and they are heads of households. So why shouldn’t they be in leadership positions and where decisions are made? This is an opportunity for me to advocate to my government, religious leaders, and community to lobby to have more women and especially from marginalized communities represented. And by mobilizing more women and girls, it is easier to advocate for your cause. Numbers give you power, voice and also space to articulate various issues. How do you view extremism at home? I come from Mombasa which is a Muslim-majority city. For a long time as a community we have been debating the meaning of the word “extremism.” To me, it is having an extreme stance about a certain idea, and not accepting anything else. But some think that extremist positions and perspectives are acceptable so long as there is no violence. But if there is no acceptance or even tolerance of another person, then using violence against them can become more permissible. So we have to be careful as we still need to co-exist with each other irrespective of our religious ideologies or perceptions that we have with each other. What is the current status of women in leadership positions? Kenya adopted a new constitution in 2010 which introduced the Two-third gender rule which stipulates that “not more than two-thirds of the members of elective public bodies shall be of the same gender”. My organization works with women and girls. It is a national organization with almost four million members nationally, aiming to empower women politically, economically, and socially. We believe that we need women in leadership positions so that they can advocate on issues that really affect them and are crucial like their security and that of their families. For a long time women have not been included in this field as security has always been a preserve of the men. Kenya just launched the national strategy on countering violent extremism and even after we lobbied to have the role of women included as a stand-alone pillar, it never happened. There is a notion that because we are half the population, women are everywhere, in peace, in media and all other fields. In reality, we need to place the women at the decision making tables because you could be many but if it is not where issues are agreed then it is useless to just have the numbers. In Kenya, women have been victims for a long time. But we have also come to realize they can be perpetrators of violence, as well as peace activists. However, owing to a patriarchal society and culture, women have not been speaking out. And now their children are being recruited by terrorist groups, especially by Al Shabab in Somalia. What do you do, as an organization, to push back? What we are doing is that we are having dialogue forums with the affected women to make them understand that this is an international problem it is not just a personal problem nor is it a religious one, hence they need to speak up about it. We urge them to come out and overcome the fears of either being targeted or being shunned by their communities. Unfortunately this is complicated as the government views all returnees as criminals and security forces are never kind to them. As soon as someone is recruited or returns from Somalia which is regarded as the center of Al Shabab, the security forces see them as guilty before they are even charged, and they target and harass their families. Our organization gave them the confidence, empowers them by giving them information and protecting them and let them know we are with them and understand their struggle. We also formed support groups, where women talk to each other. Most of those who are recruited are actually the family’s breadwinner, be it sons or husbands. Lately girls have also been targeted and a number of them have been trafficked without their consent either through being promised lucrative jobs in the Middle East or promises of education scholarships or even by marriage by already radicalized would be husbands. Last year the government gave amnesty to those radicalized youth who are returnees to surrender themselves to the authorities but the outcome was disastrous because the few who did with help of civil societies disappeared without trace and families blamed the government. The second thing we do is trying to create dialogue between the security forces and the women. The police are not loved by the masses. There is a perception that they are brutal, especially towards women. We have had many cases where women have been abused or raped. We became the link between the women and the government. We wanted the government to know that there are women who are suffering in silence. They are not guilty. They were not part of the recruitment. We organized roundtable meetings so that we create trust, information sharing that guarantees that the information is secure, and that women will not be victimized. Throughout the course of your work, have you been able to pin down the core of extremism in Kenya? One thing we came to realize is that most of the recruited youth come from homes that are not stable. The father figures are missing from their lives, and the mothers are supporting the children alone and hence the mothers are overwhelmed by their teenage boys. High poverty levels among the Mombasa coastal communities is also a contributing factor. Marginalization of the region by the government since independence in developing the social economic factors to foster development in the area is a contributing factor as the community continue to be vulnerable to terrorist groups. Initially communities were pointing fingers and blaming each other on the increase of terror attacks which brought the need to have platforms where Christians and Muslims come together on the same table and condemn the attack in realization that it is not a Muslim problem; it is a problem that is beyond them and needs both of them both to tackle. Another major problem is that historically our girls were not going to school as our cultures do not support it. Now that some are joining universities, they have become soft targets from their recruiters. Most of the girls recruited by ISIS and Al Shabab are girls who are in school or college. It is no longer about only poverty, but supporting the Islamic ideology of jihad. Recruiters have changed their tactics now and are recruiting youth who have various skills that come in handy and useful in the process. Youth who are active on social media are a target. We realized through talking to the boys and girls that they do not have anybody to talk to and that there is a missing link in the family. There are no role models in the society that they can look up to and emulate. What we do is hold forums with university students who are the most vulnerable. We engaged them, and conduct trainings with them on countering the religious narratives. We launched a mentorship program which links every Muslim with a Christian, and they start talking to each other and share information on their religion. How are you empowering women politically? We engage the government to make sure women are at the table of negotiations when it comes to security. For a long time, we were put on the side. Kenya adopted the United Nations’ resolution 1325 which created space for women engagement in peace talks. We have a plan of action, so we try to realize that. We are lobbying to make sure that the government implements the policies they have put in place. Women empathize, and have the mothers instinct to negotiate especially when they talk to the youth which makes them effective in peace negotiation process. What does the International Civil Society Action Network come in to help with what you do? ICAN gives me a network. It gives me a platform to share some of the issues that we go through. Based on different experiences of other women, we can be able to understand where people are coming from, we want to relate some of the issues we have back at home with other places because they are not unique. But we need to understand the best practice to counter these issues, such as gender-based violence. What succeeded in other countries is something we can learn and adopt in our local context. We need to be in the international arena and know what challenges women and children around the world face. As a woman leader in my town, I cannot live in isolation. I want to be part of what is happening out there. And we need to speak, from all corners of the world, in one voice. What can the world do in supporting women peace practitioner? The world needs to realize that women are very important in peace initiatives. They are stakeholders. They have families; these are their children we are talking about. They are leaders in their own rights. We need to accept they are there, they are a big number. Whatever decisions and policies are being put forth, women must be at the forefront. It is key that the women agendas are included as part of the whole processes in order to have maximum impact and an all-inclusive process.